Jamison Creek Road at Empire Grade, a great place to be if you’re headed down Jamison. I found a 100-mile route to Santa Cruz and back, something I’ve been searching for quite some time. Unfortunately it involves Empire Grade. I can’t think of a less appetizing road in the Santa Cruz Mountains. It goes nowhere, it offers no sweeping vistas, it climbs relentlessly and there’s a fair amount of traffic, although nowhere near as bad as Hwy 9. However, it stands between the coast and the bay, so there’s no way around it. I headed up Hwy 9 on another humid morning with temps in the low 60s. Lately we’ve been seeing humid days, a reminder of how good we have it in the Bay Area with low humidity. At Skyline I headed down 9, riding through the the occasional hot pocket of air. I hadn’t ridden between Boulder Creek and Santa Cruz on 9 in quite some time, for good reason. There’s traffic and narrow shoulders. It’s really too bad because there isn’t an alternative. I passed the Tannery Arts Center just before the 9/Hwy 1 junction, which has a little cycling history. Before becoming an arts center, this was the site of the Salz Tannery. Back in the 1980s and up until the tannery closed in 2001, Avocet — famous for its bike saddles — purchased leather saddle covers from Salz. Another claim to fame: Ansel Adams photographed the tanning process here in 1954. Santa Cruz was world-renowed for leather tanning from the 1860s onward. It had a ready supply of tan oak, which has tannin, a vital ingredient in the tanning process. I headed north on Hwy 1 into a gentle breeze and took note of the absence of fog, although thin clouds blocked the sun part-way on the 10-mile ride to Bonny Doon Road. Another reason I haven’t pursued the 100-mile route is Bonny Doon. It’s a steep grind for a couple miles, although it eases up and becomes more civil at the Bonny Doon winery. You can go left, staying on Bonny Doon, but most riders continue straight on Pine Flat Road. After 7.5 miles I reached Empire Grade (2,100 feet) and turned left with the Alba Road descent in mind. There’s more climbing to 2,530 feet at the Ben Lemond Conservation Camp, actually a correctional institution of sorts. Low-risk offenders are trained in fire fighting and do community service in the area, such as trail building. I passed up Alba Road, which is one of those climbs you don’t want to miss — once. It’s unrelentingly steep from Ben Lomond to Empire Grade, about 3.5 miles. I needed more miles, so on to Jamison Creek Road. Empire Grade dead-ends about a mile farther on, but not really. It’s the site of the Lockheed Martin Santa Cruz Facility. Back in the 1970s-80s Jobst Brandt rode through here and on down a dirt road to Swanton Road. The guards didn’t take kindly to Jobst, but he always managed to talk his way through. I’m told they no longer test rockets, but have moved on to munitions. I don’t doubt they have a few space aliens stashed away as well. But I digress. 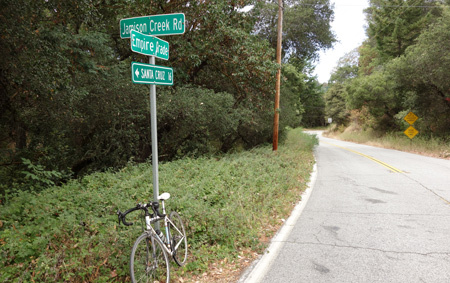 I headed down Jamison Creek Road — another lung-buster of a climb — that takes you to Big Basin Highway where you can turn right and ride downhill to Boulder Creek in a few miles. From there it was all uphill on Hwy 9. Fortunately our funky weather didn’t turn out to be so hot, only in the mid 70s. Mileage came to 101. That’s close enough for government work. This entry was posted on September 1, 2013 at 7:28 pm and is filed under Ride reports. You can follow any responses to this entry through the RSS 2.0 feed. You can leave a response, or trackback from your own site. you know i have always wanted to ride empire grade/china grade, and the the bonny doon road from the sea heading east, jamison and alba. these are the last of the major climbs in the santa cruz mnts. that i have yet to climb (paved roads ray) and i am sure there are several i am forgetting and missing but this sounds like a pretty rugged ride ray how long do you suppose it took and how many times do you stop if ever. thanks for sharing. this is what i need from you. this is the good stuff ray. keep it up! I thought the oak and madrone woods on upper Empire Grade was lovely, but maybe I had better weather. Also, BTW, if you take the round trip via Corralitos (Old Santa Cruz Hwy – Summit – Highland – Eureka Canyon – Corralitos – Santa Cruz) and return via Highway 9, it should add up to 100 miles. I don’t find the madrone woods all that attractive. If I go up 9 and then Skyline to Corralitos, to Santa Cruz, up Mtn. Charlie, I am close to 100, avoiding Hwy 9. Don’t care for 9 between SC and BC.